Welcome back! Today’s post continues the series spotlighting works from American soul and jazz poet, musician, author, and spoken-word performer from the 70’s and 80’s, Gil Scott-Heron (see the previous post, “H20 G.AT.E. Blues”). As I stated before, I was introduced to Gil in the early eighties by my roommate and best friend, at Lackland Air Force Base, Louis Davis from Philly. Gil styled himself a Bluesologist, which he defined as “a scientist who is concerned with the origin of the blues”. 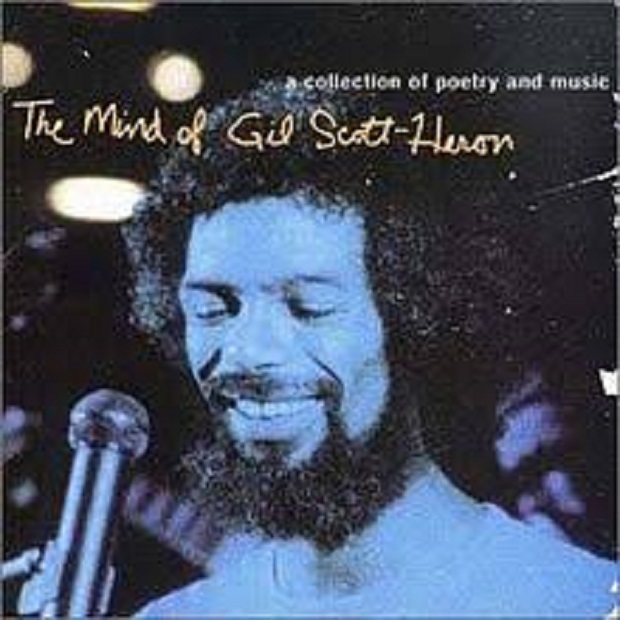 The Ghetto Code is from Gil’s album, The Mind of Gil Scott-Heron. As you will see, many of the social issues that were illuminated by the light of Mr. Scott-Heron’s keen insight, are still relevant today. I’ve expanded on some of Gil’s political and social commentary with thoughts from my own mind (in red)—as infinitely less acute than Gil’s as it might be. The Ghetto Code, the “Damned If I Know”; “Dot Dot Dit Dit Dot Dot Dash” means “Damned If I Know”! The reason this has become such a popular phrase, in different black communities around the nation, is because there are more and more things black people thought they had a handle on that they have seen—sort of—slowly slip away from them. We started to reinvestigate astrology, found out that it was an ancient art form. It’s something that we can depend on more so than Walter Concrete. We got into a vibration related to how the things were done in terms of astrology; [the] sun’s over here, the moon’s over there. People started to memorize their charts; organizing their days, their planning, their reaping, and their sowing. Then they found out somebody had been messing with the calendar! Because there’s a month in our calendar called July that was slipped in there to honor Julius Caesar and there’s a month in our calendar called August that was slipped in there to honor Augustus Caesar. Then, there’s a month in our calendar called September, which is the seventh month. It means “seventh” in Latin, but it is the ninth month in our calendar! People started saying, “Well, damn. Dot Dot Dit Dit Dot Dot Dash”. They found out octo—involving themselves with the romance languages—” octo” means “eight”. “Ocho”—very similar to “Ocho”—October, the tenth month. “Nove”—or “Nuevo” for “nine”—November, the eleventh month. “Dece”—or “Diez” for “ten”—December, the twelfth month. “Dot Dot Dit Dit Dot Dot Dash,” “Damned If I Know”! I believe that problem has originated right here, in February. Nothing personal, for those of you born in February, but there is something wrong with February! I have been watching February closely, and I have never quite been able to get a grasp on where February is coming from because it would seem that it’d take at least thirty days for it to be a month—the precedent had been established by the other eleven months having all at least thirty days. [But in] February, you get twenty-eight days, three years in a row. If you make it [to the fourth year], you get a bonus; February 29th. Why don’t they make that January 32nd? [I think] it’s because they know there’s something wrong with February, and they’re trying to even it out while nobody looking! This is like, if somebody was to give you four weeks and say, “Here, you have four weeks of your very own” [but when] you take ‘em home, unwrap ‘em, you find out one of the weeks only has five days! It’s not that you have anything against that week, it’s just that you know white folks—ain’t gon’ be no weekend! You gon’ go home Friday night, get up the next day [and] it’s Monday, you gon’ have to go to right back to work! You say, “Well, Dot Dot Dit Dit Dot Dot Dash! I got shortchanged. I had a week, but it wasn’t quite a week! Dot Dot Dit Dit Dot Dot Dash”! The same thing happened to me in terms of looking at the alphabet. The alphabet was originally called “The Alpha Beta” and it [was] supposed to contain all of the symbols—and that’s important—all of the symbols from Alpha to Omega. Alpha was the beginning, Omega was the end. Alpha was the letter “A,” the beginning. Omega was the end, the letter “Q”, but “R, S, T, U, V, W, X, Y, Z”? They did not say that from Alpha to Omega was from beginning damn near to the end. They said, “From beginning to end.” I took their word for it! The end was Omega, and that’s “Q”. [What’s up with]…all these extra letters? That means there may be some words out there that don’t mean nothing! Somebody very soon may come up to you, using the alphabet as it was originally intended–from Alpha to Omega—and say something like, [gibberish]. “Dot Dot Dit Dit Dot Dot Dash! Damned If I Know! I ain’t got the, I ain’t got the papers. The letter I would like to go into with you very briefly is the letter “C”—it is one of my favorites. Oh, it’s very underrated in terms of letters, you know? Very [intellectual] people sit around and comment on the virtues of the letter “C”. It is the first letter in “Cash Money”. It is the first letter in “Constitution”. And it is the last letter in “Music”. It is the first letter also in “CIA”. Ears glued to our telephone. Why won’t they leave us alone? “Dot Dot Dit Dit Dot Dot Dash,” “Damned If I Know”. Ears glued to our telephone, trying to pick up on The Ghetto Code. “Hey, Bree-is-other me-is-an, how you fe-is-eel? Is everything all-re-is-all-right? Well, why don’t you, uh, well, why don’t you tell me about this pe-is-arty to-ne-is-ight? You going? We-is-ell, why don’t you bring me a ne-is-ickel be-is-ag? Yeah, and if you get back, why don’t you bring some be-is-am-be-is-oo so I can re-is-oll all these up. I appreciate it”. I know whoever it was they was paying to listen in on my phone had to be saying, “Well, Dot Dot Dit Dit Dot Dot Dash. Damned If I Know”! The “C” that reminds you of “CIA” and “Cash Money,” they’ll come together in a case that concerns itself with Howard Hughes. The CIA gave Howard Hughes 400 million dollars cash money—give or take a million or two—you understand, and told Howard Hughes that he was to build a salvage ship. The salvage ship was going to be called the Glomar Explorer. The Explorer was going to go out in the Pacific to try and recover a Russian submarine that sank in 1968. The reason our government was so interested in this submarine was because of the “C”—codebooks onboard. We assumed that Howard Hughes, indeed, did build this ship and equipped it with a giant magnet. We would not assume that Howard would come back with a little bitty magnet for all that [much] money. However, the submarine that sank to the bottom of the Pacific had broken into three parts. The magnet went down, brought up the first part of the submarine, had onboard seventy dead Russian sailors. Well, no real advantage there! I mean, it hadn’t been worth a dime [or a ruble] to the Russians. Which means that, in certain instances, we could see ourselves having been overextended. [The giant] magnet went down, brought up the second part of the submarine, had onboard two bombs—two warheads, two Polaris-type warheads, two nuclear weapons. [The] point is that this country already has plenty of bombs! [As a] matter of fact, they have little bombs, big bombs, round ones, and square ones, and have been stockpiling them for quite some time–to the point where they now have damn near one bomb for every individual [in America]. [As a matter of fact], if you don’t like the way they’re running things and you call them up and tell them, they may send you your–neutron, oltron, electron, whichever kind of tron. Which means that, for 400 million dollars, we have recovered seventy dead Russian sailors, two bombs we did not need, and, perhaps, Russian codebooks for codes the Russians weren’t even using anymore! “Cash Money” may not be what you need right through here. You might need some explanations related to other activities—like, the “C” might remind you of “Cuba”! The “C” in “Cuba” and the reminiscence of that reminds us that the CIA undertook a very secret project towards Cuba called the Bay of Pigs Invasion! The Bay of Pigs Invasion was very much repelled, but it did reveal “C”—clues—clues that had to do with assassination attempts on a man whose name starts with “C”—Castro. The “C” might remind you of “Chile”. Over eight million American dollars spent in Chile by the CIA to help overthrow a man named Salvador Allende, who just happened to be a “C”—communist. The “C” might remind you of the “Canal”—say what?—the Canal. The Canal? The Panama Canal? There seems to be some problem in dealing with the geography of the Panama Canal—it’s not really that complicated. There’s a little bit of Panama over here, then there’s some canal, then, there’s a little bit of Panama over here, but the Panamanians do not control the Canal. You could think of it as if Amtrak came through your crib. You would at least want to know the man who was punching the tickets and have a very tight relationship with him. The “C” that reminds of the “Canal” could remind you of a “covert CIA operation,” related to “C”—Columbia, and assassination attempts and destruction attempts on a man whose name starts with “C”—Che Guevara. The “C” might remind you of the “Congo”—say what? —the Congo. The Congo? The “C” that reminds you of the “Congo” could remind you of how geography sometimes changes. Looking at the map of Africa today, where you see the word “Zaire,” you would, at one time, see “Congo” or “Belgian Congo”. Remembrances of this would remind you of a man who stood for African unity, a man named Patrice Lumumba, but somehow, Patrice Lumumba was assassinated during a mysterious “C”— “coup d’état”. Was that Lee Harvey Oswald over there or was it, Lee Harvey Oswald, over there? Was he 5-feet-8, 165 pounds or was he 6’2”, 205? Was he photographed for his passport in Dallas or was that Moscow? Arthur Bremer? Was he from Maine, Maryland, or Massachusetts? Was he captured in the Midwest or the Middle East? And if they always have a chance to photograph these people before they commit their crimes, why can’t they stop them? But, [there are] other problems we would still like to see solved like JFK—you believe all that? Malcolm X—you believe all that? All of this was some great, big old “C”—coincidence—or just a little bitty “C”—conspiracy? The first one is: the CIA—who the hell runs that organization? The second one is: who runs this country?